Sometimes we get caught up in the motions, in the mundane, in the trivial. Then in a New York Minute, a yoga leader is instructing you to put your face in dirt. It was unexpected, and at first I was taken back. Where is the vinyassa? Am I going to get a good workout from this? Maybe I should have signed up for a different session. Suddenly all these insecure thoughts surfaced. Then I opened my eyes wide to the beauty of the earth and to those around me who knew this was a special day. The energy was there, if you allowed it to enter in. 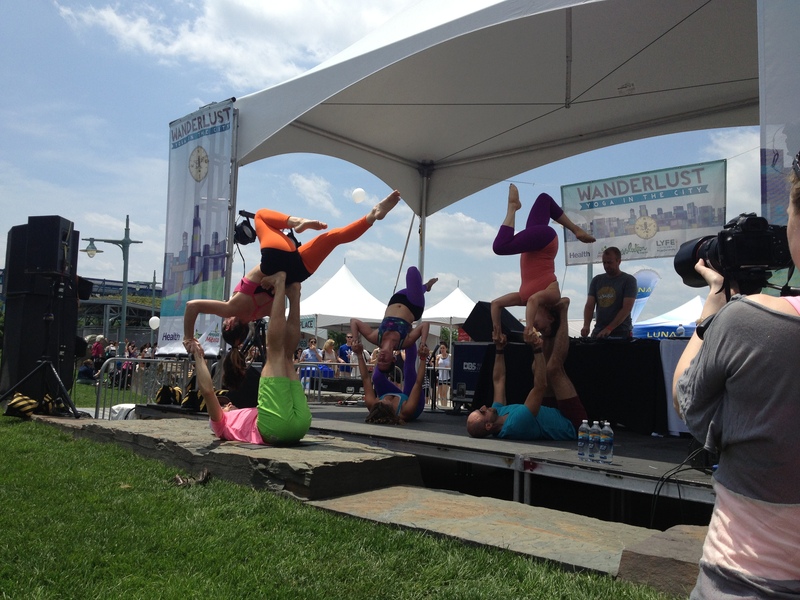 Last Sunday was a free one day session of Wanderlust “Yoga in the City”, a precursor for the Wanderlust Festival that is coming up in Vermont later this month. It was Mecca for yogis as I walked from the 23rd street subway station to Hudson River Park noticing all the colorful outfits and yoga mats strapped to their backs. 1000’s of yogis packed into the park overlooking the Hudson with sailboats in the water, Chelsea Piers to the left, a view of the Freedom Tower and New Jersey in the distance. The event was extremely well produced with a beautiful stage, wonderful leaders, a fun DJ and great healthy vendors. It was magical with acroyogis, a “pregnant goddess” yoga leader named Twee, and lots of great food which included a cold avocado smoothie. 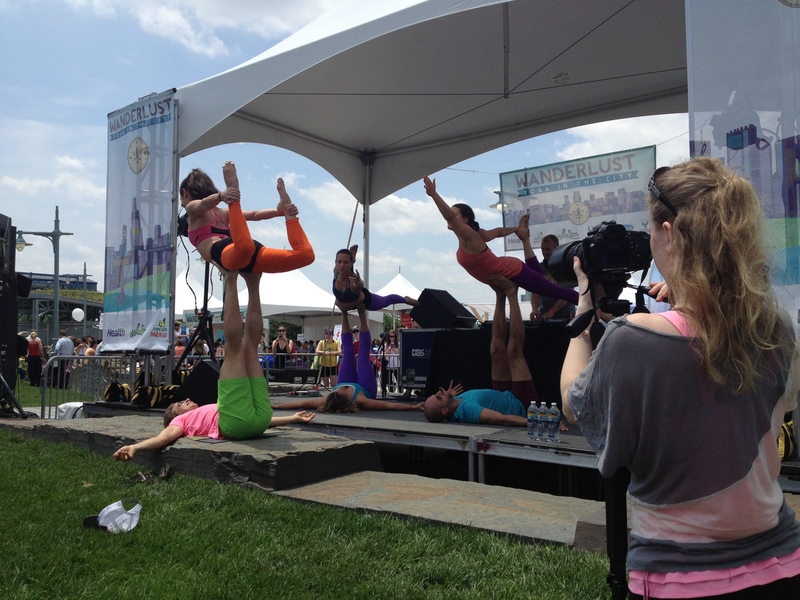 The Health Magazine booth was open, airy, fun and interactive. 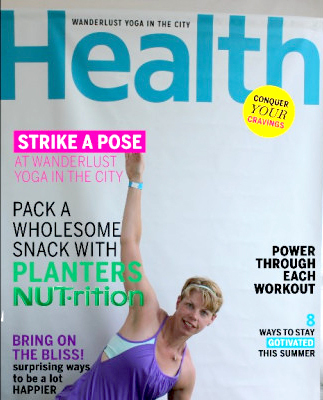 Strike a pose to be on the cover..why yes please! Clearly the highlight of the day was on the spiritual place of the yoga mat. 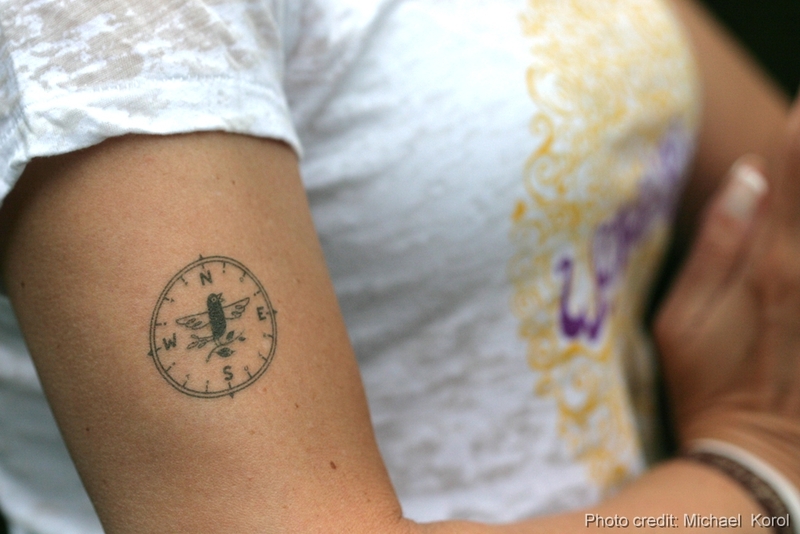 I may have had wandered at first, but the leaders helped me find my true north for the day quickly. To smile and to thank myself for taking time to experience the journey and share it with beautiful fellow New Yorkers. Our faces were deep in the ground to be one with mother earth and it was euphoric. Suddenly a deep appreciation for the world we live in entered all my senses. This was not about how deep your downward dog can be. With a loud Om shanti, we announced to the city that it was time to find peace.